My Not so Little Girl! My little girl has been growing up so fast lately! She is eating rice cereal and some fruits and vegetables. She is rolling over. Sitting in the cart at Joann's! Trying to talk all the time. She is just growing up way to fast for me! Showing off her Memorial Day outfit and her strong leg muscles! First time in a cart! What a big girl! She loves rolling over but once she get on her stomach she gets stuck and she hates being on her stomach! My review and giveaway for this week is for Woolzies Dryer Balls. These six eco-friendly dryer balls are a great alternative to chemical ridden dryer sheets and fabric softeners. They are handmade out of fine New Zealand wool, no chemicals added. I love this because the fewer the chemicals that have to touch my baby's skin the better. Also if we ever found out that she is allergic to wool we would still be able to use these dryer balls because they don't shed! At Target you can buy a 103 oz., 120 load bottle of Downy for $8.99. Good deal right? NOT! With Woolzies Dryer Balls you only pay $34.95 and you get 1,000 loads. With Downy you would have to spend over $75 to get 1,000 loads. Another way you will save money is because they reduce drying time by 25%, that will add up very fast. One of the biggest reasons for why I was so excited to get them was because of the 25% decrease in drying time. This is because I live in an apartment complex that does not have hook-ups in the apartments but they have a laundry room on every floor. In the laundry room they have 2 very small washers and 2 normal sized, but not very efficient, dryers. Also each load costs money. When I first tested the dryer balls out I did it with the colors because I had 2 washers full so I put each load into a different dryer, one with the dryer balls and one without, so that I could compare the results. The results were not too drastic. Normally I have to put a colored load in for more than one dryer cycle but both loads were pretty dry. The load without the dryer balls did have a couple of items that were damp so I am going to conclude that they did help with the drying time but probably not by 25%. One thing that did happen that I wasn't expecting was that they did leave a little bit of a scent on my clothes. I didn't expect this because I assumed that most hype-allergenic products are scent free but the dryer balls smell very good so another plus. I could not think of any cons, except that it is one more thing that I have to carry to and from the laundry room but if you have a laundry room in your own apartment or house than you will not have to worry about that. In conclusion, I would totally recommend these to anyone who does laundry. I know that I am going to restock mine after 1,000 loads! Woolzies has agreed to give one of my readers their own box of Woolzies Dryer Balls so don't forget to enter below!! This is such a fun, different and easy frosting recipe! I made them for dessert on mother's day and they were a hit! Put all of the ingredients, except for the vanilla, in a bowl or pot that you can put in a pot of simmering water. Whisk the sugar mixture until the sugar has melted and it is hot to the touch. Put the mixture into your kitchen aid or an equivalent and mix for 3 minutes, during those three minutes slowly add in the vanilla. At first the mixture is going to be very liquidy so make sure you wait the three minutes or a little longer until it puffs up and it will believe me I didn't think it was going to but it did! The Frosting should be done so add to a bag, piping or regular plastic bag, and pipe on cupcakes with any size tip that you want or you could even do it without a tip! Now enjoy! I added chocolate chips because it gave it a little bit more flavor and everyone else liked it better that way too!! Let me know what your favorite kind of frosting is! This is my new favorite way of making potatoes. Each part of it has both soft and crunchy parts on it. It is genius and delicious. Thinly slice your potato. This is fairly easy but it is also pretty easy to mess up if you are not paying attention so make sure you don't cut all the way through or that you cut at a slant because than you will cut a wedge out of your potato. Now put in the oven for about 40 minutes, I think mine was in around an hour or a little longer but we picked out big potatoes so it all depends on the size. Finally take out and enjoy! I really liked this because I always waste a lot of the potato is I eat it baked because I don't like the skin when it is soft but on this the skin is crunchy and so delicious. It is really good if you pull each slice off and dip them in ketchup! Don't forget to enter to win handmade and personalized tote and key chain from Ditzee Designs! What is your favorite way of eating a potato? I know that Mother's Day was last week so I am a little late on this but I left my camera at my parents all week so I couldn't get the picture I wanted for this post until now. 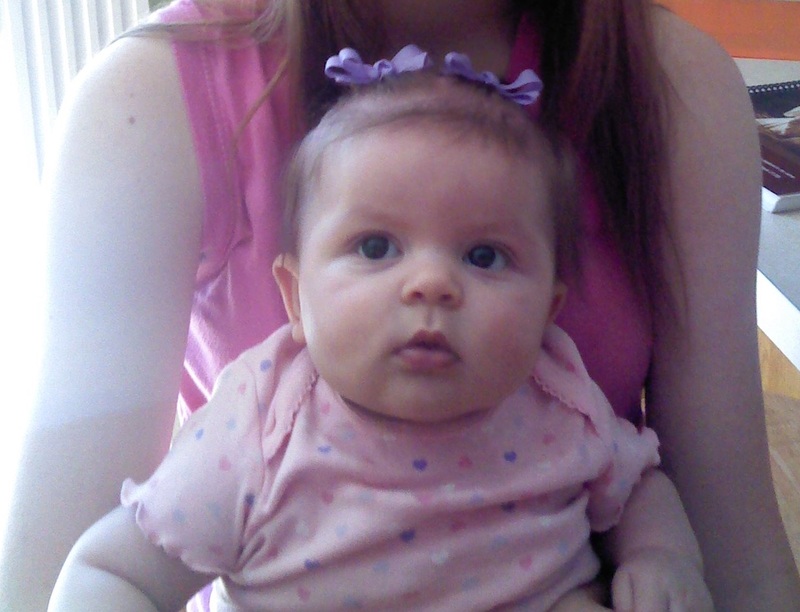 My first Mother's day was perfect! I got hot breakfast, lots of presents and spent the afternoon at the beach! What could be better than that? It was Savannah's very first time to the beach! She had an ok time but it was very windy so there was a lot of sand blowing around but she was happy once she was able to fall asleep. This is my peanut butter M&M pancake! I highly recommend trying this out at least once in your life! Peanut butter M&Ms are my favorite candy so I obviously loved this but you will need a glass of milk on the side! I love being a mom so much and I wouldn't trade it for anything! Step one, put Savannah down for a nap....CHECK! Cut up the chicken and then put into the bottom of the crock pot. Mix all of the ingredients, except for the chicken and cornstarch (although I think I did the recipe wrong because I put the cornstarch in now but it still tasted fine) and add to the crock pot. Put crock pot on high for 4-6 hours or low for 6-8 hours. If the sauce turns out too runny you can mix 2 TBS. of water with 2 TBS. of cornstarch and then add to the sauce to thicken it up a little bit. Serve over rice and broccoli. I thought the flavor was really good but the chicken was really dry so I don't think I would make it on the longest setting again,next time I think I will try it on the low setting and see if that makes a difference. What is your favorite meal to make over rice? Comment your answer below! Do you have a huge stash of plastic grocery bags stashed somewhere in a huge pile? I did until I found this helpful hint of how to make those bags into small easy to store triangles or "footballs". First flatten your bag out. Now start your triangle at the bottom and work your way up to the handle. Stop when you get to the handle. Fold the handle in half. Tuck the handle into the triangle. Now do it again and again and again until you have done them all! This is super easy and saves up a lot of space! Where are you going to put your new plastic "footballs"? Let me know in a comment below! I wanted a Bumbo floor seat even before Savannah was born. I finally got one a couple weeks ago as a gift from my mother. I also got a Bumbo tray. These items are perfect for babies around the age of 3-7 months depending on when they start to hold their heads up and when they start sitting up. Bumbo is a company that specializes in products that will heighten your child’s development. Their Bumbo floor seat is for babies who can hold their heads up but cannot sit up yet. It is designed in a way that supports the baby up into a sitting position so they can see and interact with their surroundings. The Bumbo tray attaches to the floor seat so the baby has an easy way to reach their toys. There are a few things that I like about these products. First of all my baby girl loves them! She is always excited when I put her in the seat and she can sit up and look straight at me at the same time. Also I like how the seat is made of foam, when I saw these seats in pictures I always thought they were plastic but foam is obviously more comfortable than plastic. The tray is such a great accessory to the seat because it is easy to put together and put on and it makes play time a lot easier. The only down that I can think of about these products is the price of the floor seat. It is only $50 but when you are in your early 20s, 2 years into your marriage, still in school and have a baby $50 is a lot to spend on a luxury item. Even though it is over my budget I would highly recommend that anyone who has a baby who can’t sit up yet or who is expecting that they should purchase, or ask for, a bumbo floor seat and play tray. Look at how much fun Savannah is having with her Bumbo floor seat and tray! This is so Easy and such a fun treat for kids and adults! A year or two ago when I was in Idaho at school I made these and my husband's brother and friend came over for dinner and they tried them and the whole pan was gone before they left and before they left they got some jello and knox mix from our cupboard so they could make their own. Pour the jello powder and the knox mix into a bowl and mix together. Boil 2 1/2 cups of water and pour into the powder mix and whisk as you pour or soon after. Pour into a cake pan and put in the fridge until firm, about two hours. Take out of the fridge and cut up into blocks or shapes or just rip pieces off as you go, whatever you prefer. I ended up making raspberry and lemon flavored knox blox and I usually make those flavors or lime but you can make any flavor you like! 1. Mix together the Jello powder and the Knox mix. 2. Boil 2 1/2 cups of water. 3. Mix water and powder. 4. Pour into a cake pan. 5. Put in fridge until firm. 6. Cut up and serve. Comment below if you have ever made or had knox blox. Do you like them? What is your favorite flavor? 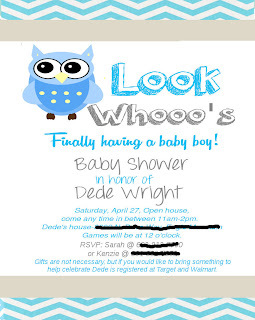 Do you want super cute and inexpensive announcements or invitations? If you do I know where you should go to get them! My cousin Mackenzie of course!! She made a super cute baby shower announcement for her sister and it turned out so well!! She is only charging $10 for Baby shower, bridal shower, graduation, baptism, baby announcement and $15 for wedding announcements. 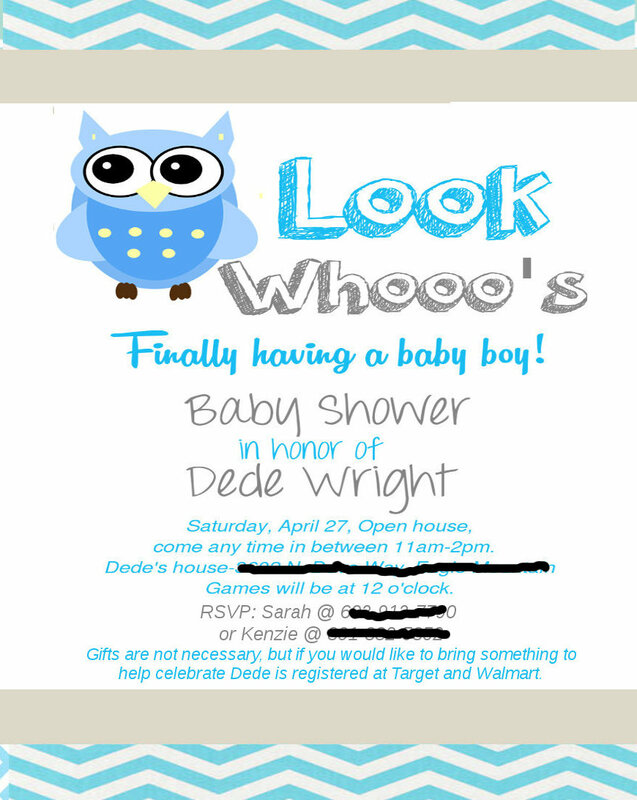 She will design the announcement or invitation and send you the finished product and all you have to do is order more copies from Walmart which is also inexpenzive. This is a really good deal for a really good product. Here is the baby announcement she designed! Isn't it super cute? We went to Savannah's 4 month check up a couple of weeks ago and we found out how much she weighs! She is 25 inches and weighs 15 1/2 pounds. 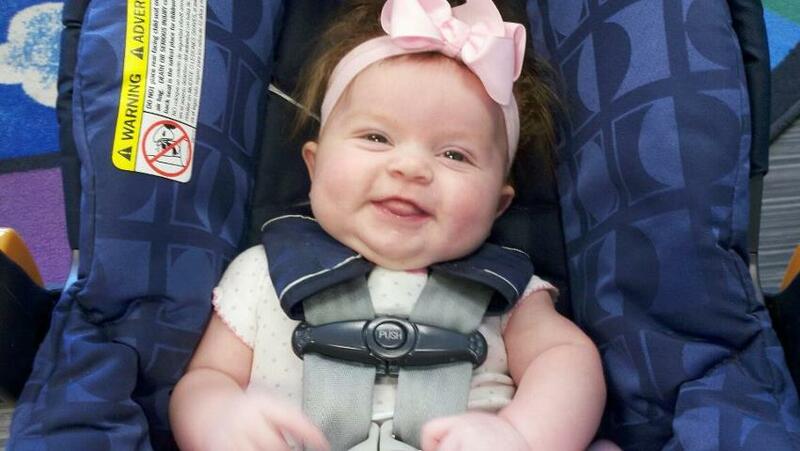 She is in the 90th percentile for her height and the 70th percentile for her weight! Daddy was happy to hear that he contributed at least one thing to our baby haha since we pretty much is my clone! Savannah has been and still is such a happy baby. She has started to try to roll over in the past month and it is so fun seeing her get closer and closer. She is also getting so good at grabbing things and pulling them to her mouth. One of my new favorite things to do with her is to try to get her to laugh and although she dosen't laugh a whole bunch it is worth the wait when she finally does laugh. Savannah is growing up so fast and it is so fun to see her learn new things and just become more independent and it is also sad to know that she is starting to need me less and less but I know that there will always be time when she will need my help! I love her so much! She is the cutest baby ever!